Selected in the third round (27th overall) of the 2015 CFL draft and signed on May 28, 2015. 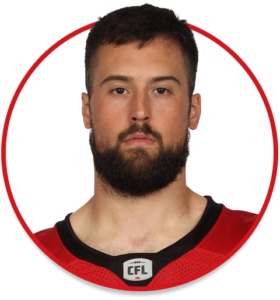 (Calgary) In his fourth season with the Stampeders, Langlais took over the starting fullback role and made 16 regular-season starts. In addition to his blocking work, he established career highs with six receptions for 105 yards. Langlais had a career-best 33-yard reception in a Week 21 contest at BC. He also saw special-teams action and made nine tackles. Langlais started both of Calgary’s post-season games. (Calgary) Langlais played 18 games and had 16 special-teams tackles. On offence, he had three catches for 30 yards. In Game 15 against Hamilton, he recovered the loose ball after a blocked punt and scored his first career touchdown. Langlais had one special-teams tackle in the Western Final and two kickoff returns for 40 yards and one special-teams tackle in the Grey Cup. (Calgary) Langlais played 16 games and had 17 special-teams tackles. He also played in the Western Final and Grey Cup. Langlais was on the one-game injury list for Games 17 and 18. (Calgary) Langlais played 17 games and had 11 special-teams tackles. He was on the one-game injury list for Game 16. Langlais also played in both playoff games. The converted defensive lineman played fullback for Sherbrooke in 2014 and helped the Vert et Or rank ninth in CIS in rushing. Langlais carried the ball four times for 14 yards and added five receptions for 44 yards while also seeing duty on special teams. Langlais played at Cegep Beauce-Appalaches in Saint-Georges, Que., before enrolling at Sherbrooke.